We are a very active, happy and friendly group and welcome new members, not only actors and singers, but also back-stage people who can sew, paint, or are handy with a hammer. The Drama Group rehearses at the above location and times. 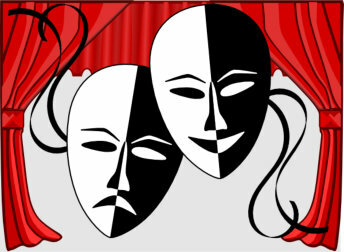 We present two productions a year usually with a one-act play in the first half and a variety of entertainment in the second half although we now include a Murder Mystery play from time to time. It’s been a busy time for our group recently. In October we had our Autumn Shows and in November we performed a medley of sketches, poems and songs at the Sunday Social. Tickets cost £12, including the buffet supper. We look forward to seeing you. In October at Aughton Village Hall we performed “Slim Chance” a one act play about a failing slimming club. Anyone who has ever joined a slimming club would recognise some of the characters! This was followed by “Commemorate and Celebrate” when we paid tribute to the various historic events of 100 years ago and the period which followed. Thank you to everyone who came to see “A Fate Worse Than Death”. We hope you enjoyed your evening. Here are a few reminders. 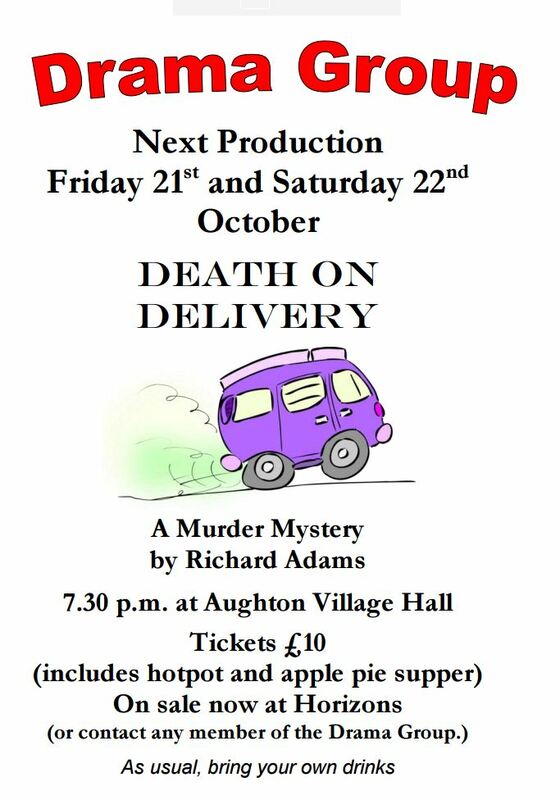 Our next production will be on Friday 26th and Saturday 27th October at Aughton Village Hall and we look forward to seeing you then. Last year the Drama Group were asked for volunteers to take part in a short film being made by Edge Hill University students. The film, “Take Care” is now available to view on youtube and stars Jackie Roscoe and Maureen Bridge. Congratulations to both of them. In January 2018 we were invited to entertain the Sunday Social Group with “Radio Aughton – Live (well almost)”, so thank you very much to Val Bullen and her team for inviting us. We had a great afternoon. We had a great time at the Summer Social on 2nd July. After a splendid afternoon tea we performed “On Parade” a sketch by one of our group, Ken Skimming. We were delighted to be invited by the U3A choir to perform at their “Summer Serenade” on 11th June at Aughton Village Hall. We presented 2 sketches by Kerry Rooney – “Lost at Sea” and “Everything in Moderation” and a monologue written by Steve Morris, Northern Bye Bye Blues”. The audience were very appreciative and we all enjoyed the evening. As a change from our usual format we presented a Murder Mystery Night at Aughton Village Hall in November 2014. Thank you to everyone supporting this event. Here is a photo of the cast in rehearsal. Did you spot the murderer? We presented the World Premier of “In the Mood”, a one act play by Frank Gibbons who attended the Saturday show. 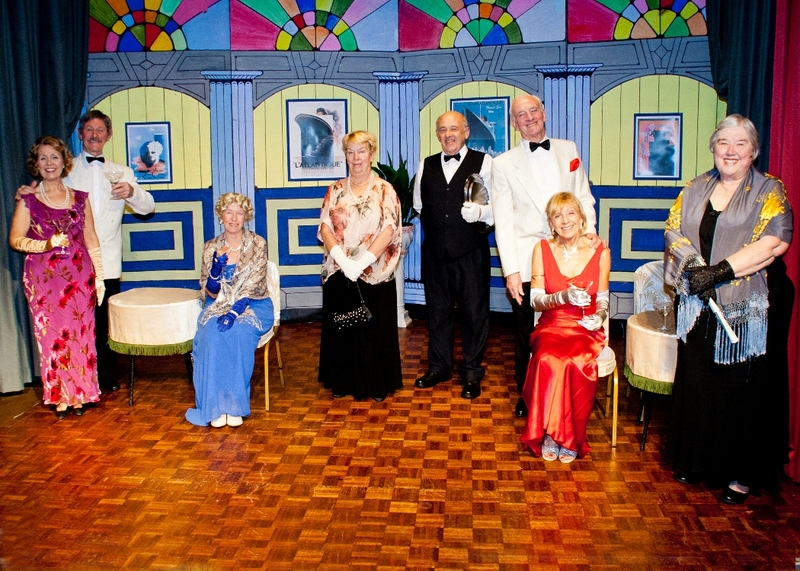 The play was followed by “A Continental Journey”, a variety of music, comedy, sketches and dance. It was ‘all aboard’ the S S Persephone when the Drama Group presented ‘The Persephone Affair’ – a murder mystery – in Aughton Village Hall, which was attended on Saturday evening by the play’s author Kevin Green.